The Oxford Movement originated in 1833, led by John Keble, John Henry Newman, Richard Hurrell Froude and Edward Bouverie Pusey among others. Their central aim was to 'restore the High Church ideals of the seventeenth century' (Oxford Dictionary of the Christian Church). This movement, by no means supported by all the Anglican clergy of the time but which had many followers throughout the nineteenth century and beyond, was also a strong influence behind the re-establishment of religious orders within the Anglican Church. Fr Richard Meux Benson, the founding parish priest of the parish of Cowley St John, was a strong supporter. The Bishop of Oxford from 1852 to 1869, Samuel Wilberforce, was also a major supporter and took a particularly positive attitude towards the newly founded orders of sisterhoods, several of whom participated in the work of the Cowley St John parish in its early years. The Society of St John the Evangelist (SSJE) was founded by Fr Benson in 1866 in the early years of his long ministry in Cowley St John (see fact sheet 2 Father Benson). On the feast of St John the Evangelist that year, 27 December, Father Benson, Father Grafton (from Boston, USA) and Father O'Neil took their vows together to form the new Society. This was all the more important as it brought into being the first Anglican religious community for men since the Reformation. Their mission house, initially at Magdalen Terrace on the Iffley Road, moved in October 1868 to Marston Street, where Fr Benson had already begun to build a substantial home for the Society. That mission house was soon housing a thriving and growing community that dedicated itself to national and international mission work. Missions were established in India, North America and South Africa. Letters from its priests working in those areas gave regular updates on their progress for the parish magazine, The Cowley Evangelist. Fr Benson himself played a leading role in promoting its international mission work throughout England. 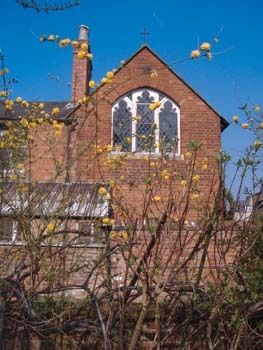 The mission house served as the centre for the international order, while also running retreats. Priests returning from missions abroad would give talks on their work to the various societies in the parish and beyond. A Fellowship to support the SSJE was established, and parishioners among others raised significant sums of money for the Society's mission work at home and abroad. for the dedication of St Johns Church 1896. Although there was a small chapel on the top floor of the Mission House, the expanding mission work and the number of visitors to the House alike made the need for a new church� a priority. The foundation stone was laid in the grounds facing the Iffley Road in June 1894, and the Church of St John the Evangelist was dedicated by the Bishop of Oxford on 12 May 1896. 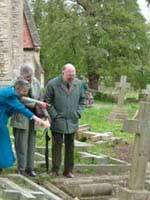 Alongside its world-wide mission work, the SSJE took an active interest in the parish of Cowley St John. Regular updates on the parish schools and welfare projects were published in The Cowley Evangelist. Locally the fathers were known as the Cowley Fathers or, more affectionately, as the 'Cowley Dads.' Many of them were buried in the Ss Mary & John churchyard, their graves marked by simple pented (roofed) wooden crosses, now replaced by a composite memorial in the form of a tall Cornish granite celtic cross (D202) positioned over the grave of Father Benson. With numbers declining sharply in the second half of the twentieth century, the Cowley Fathers left the Mission House in 1980. It has since then served as the premises for St Stephen's House, a theological college of the Church of England which treasures its roots in the same Oxford Movement. A widow, Mariquita Tennant, who lived in Clewer near Windsor, became aware of the plight of local girls and women who were caught up in poverty and prostitution. From 1848 she began to rescue and give shelter to these women in her home, known as the Clewer House of Mercy. Here they received accommodation and some form of training in domestic duties. Mariquita Tennant began to suffer from ill health and was unable to continue the work in the House. By 1851 the House of Mercy had moved to another site in Clewer, Nightingale Place in Hatch Lane. The House of Mercy was supervised by a council of clergy and lay men including the Reverend Thomas Thellusson Carter, Rector of Clewer. He had been at Christ Church and was familiar with Pusey, Newman and Keble, who had led the Oxford Movement. When Mariquita Tennant withdrew from the work in the House of Mercy a replacement had to be found for the growing community. Harriet Monsell, another widow and the sister-in-law of a colleague of Fr Carter, took over the work in the House. On 30 November 1852 she was professed in Oxford in the presence of the Bishop of Oxford, Samuel Wilberforce. She became the first Superior of the Community of St John the Baptist. Other Sisters moved into the House which was then exclusively run by the Sisters. 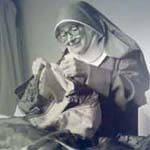 As the Sisterhood expanded other communities were established, and the Sisters' work extended to nursing the sick and educating young people. There were instances of two sisters from the same family joining the Order. Some families had a sister in the Clewer Community and a brother in the Society of St John the Evangelist. Father Maturin was the brother of Sister Fidelia and Sister Johanna, and Father Congreve was the brother of Sister Selina. Thus there were several links between the Clewer Sisters and Ss Mary & John parish. Father Scott, second vicar of SS Mary & John, invited the Clewer Sisters to the parish in 1890. Initially two Sisters, Sister Cordelia and Sister Catherine Esther, moved to East Oxford. They mainly worked in the local schools and among some of the organizations set up for women and children. As the parish expanded they took on more work in the neighbourhood. From 1904 the Sisters lived at 14 Magdalen Road. They advertised their services in the parish year book in the 1920s, offering visits, help and other information. In 1860 the Community had taken over the supervision of Manor House, an institution providing refuge for girls and women. This accommodation was owned by Merton College and situated in Holywell. 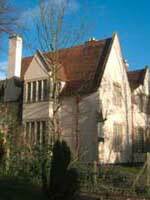 The Manor House was transferred to Littlemore in 1929 and became St Mary's Home until it closed in 1949. Girls who were rescued and stayed within the community were known as Magdalens. 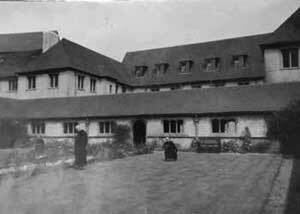 When St Basil's Home for Aged Women opened in 1891 on the Iffley Road, some of the Magdalens went to work there. In December 1936 the Clewer Sisters left the Mission House in Magdalen Road. The Society of St John the Evangelist recruited female teachers to form a religious community to devote their time to teaching in elementary schools. In 1895, two qualified experienced teachers became novices and moved into Marston Street to start the Sisterhood of the Holy Childhood. Other sisters followed, and since the Sisterhood was expanding, in 1897 the houses at 9 and 10 Marston Street were purchased for them by the Society of St John the Evangelist. All Sisterhood teachers had to be qualified as assistant teachers under S 50 of the Education Code. The sisters received maintenance costs from the schools in which they taught, which was much less than other teachers received� The money earned by the sisters was paid into a common fund. 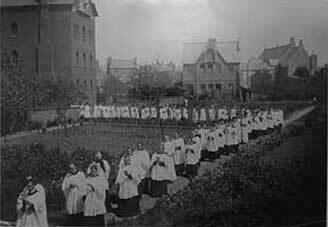 The Society of All Saints Sisters of the Poor was one of the first Anglican Sisterhoods to be established. It was founded in London by Harriet Brownlow Byron. She attended Margaret Chapel in West London where the parish priest was William Upton Richards. Mr Upton Richards had been involved with the Park Village West, a Sisterhood founded in 1845. In the same year, Harriet Brownlow Byron met Mr Upton Richards and received spiritual guidance from him. She began district visiting in the parish and supervised a district poor school for a while. Earlier she had undertaken nurse's training. In September 1851 a house in Mortimer Street was acquired that later became St Elizabeth's Home. October 18, 1851 is the Foundation Day for the All Saints Sisters of the Poor as this was the day that Harriet Brownlow Byron began to live in the house. She was joined by Sarah Easton on 27 December - the beginning of the community. The primary religious vocation of the Sisterhood was to 'provide a Religious Asylum for aged and infirm persons in destitute circumstances.' Gradually more joined the community, but in the first years those who arrived were in need of help or care. Harriet Brownlow Byron, Sarah Easton and Ellen Wilson were professed by Mr Upton Richards on 5 May 1856. On 3 August of that year, Harriet Brownlow Byron was elected a 'Mother for life' of the Society of the Sisters of the Poor. �The next day the community, including Sisters, orphans, aged women, incurables and girls in training� moved to Margaret Street. The new building was blessed and the Superior installed by the Bishop of Oxford, Samuel Wilberforce, accompanied by the Reverend TT Carter, the Rector of Clewer. When Mr Upton Richards died in 1873 Father Benson took over as his successor. His position was not well received by everyone. 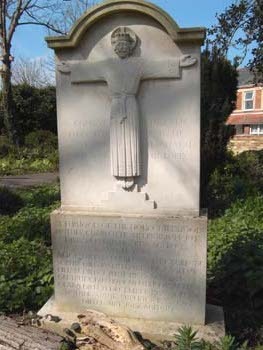 The work of the community had extended to Eastbourne by the time of Mr Upton Richards' death and continued expanding into other parishes, including Edinburgh where a Mission House was opened in 1875. Nursing provision had become a particular interest for the Sisters. For example, in 1862 at University College Hospital in London, the Sisters took over the responsibility for all the nursing and nurses' training. Another area of expanding work carried out by the Sisters in the 1860s was workhouse nursing in Manchester, where the very poor were tended in difficult conditions. As the century progressed, the Sisters opened other hospitals, especially for people with incurable illness, in Eastbourne, Finchley and Seaford. They took over the nursing work at St John's Home in Oxford in 1881 and were given full ownership 7 years later (the subsequent building work was crowned by the Chapel, designed by Ninian Comper in pure late Gothic style and consecrated in 1907). International work also developed. The sisters went to North America, South Africa and India, and worked with established missions run by the SSJE. During the twentieth century there were many social changes, not least the provision of many welfare services by national and local government. This led to the Society of All Saints Sisters of the Poor reviewing their services. In 1976 the Mother House moved to Oxford, where the community is currently involved with a number of innovative projects including a hospice for children, a respice for young people, and a centre for the homeless (see Fact Sheet 7 St John's Home). This order was established in 1861 and based in Laleham in Middlesex. In February 1937, when Father Painter was the parish priest of Cowley St John, the Sisters from St Peters in Eccleston Square in London came to live in the Mission House in Magdalen Road, recently vacated by the Clewer Sisters. The Sisters also worked in other parishes and abroad. Retreats were held at Laleham. One of their projects at St. George's Oldbury House in Stroud (later moving to Cheltenham) catered for what were then known as 'Backward Girls.' The Sisters left the parish of Cowley St John in the 1940s. The Sisterhood of the Compassion began in 1864. A House of Compassion was established in Howard Street in East Oxford and took in mothers and their babies. 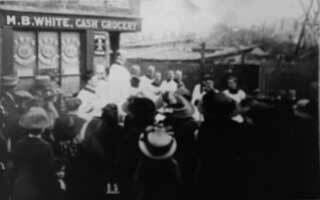 One of the first celebrations in the Robin Hood School in 1869 was hosted by Sisters from the House of Compassion. This enclosed community was founded in 1906 with the first professions being made to Father Benson in the Chapel of the All Saints Sisters of the Poor. The first house was in Leopold Street, but after a brief spell on the Cowley Road, they moved to the present mother house, the Convent of the Incarnation, known as 'Fairacres'. It is a community dedicated to prayer; their witness includes hospitality, the encouragement of ecumenical dialogue and the publication of short works on prayer and the life of the spirit. Jo Manton, Sister Dora, The Life of Dorothy Pattison, Worcester and London: Metheun & Co, 1971. Susan Mumm, Stolen Daughters, Virgin Mothers, Anglican Sisterhoods in Victorian Britain, London: Leicester University Press (1999). Martin Smith (ed) Benson of Cowley, Oxford: OUP, (1980). Mary Stocks, A Hundred Years of District Nursing, (London: George Allen & Unwin, 1960). M V Woodgate, Father Benson, Founder of the Cowley Fathers, Geoffrey Bles, London, (1953).